Karla Eckhardt: Hello and welcome to The Florida Bar Podcast brought to you by the Practice Resource Institute on Legal Talk Network. This is Karla Eckhardt recording from the 2018 Annual Florida Bar Convention in Orlando, Florida. Thank you for joining us today. Joining me today we have Denis. Okay, so what I want to talk about today is first you are going to tell us a little bit about yourself and then we are just going to talk about really important topics that you have discussed throughout the Convention and what you want our listeners to know, because we really think it’s important to get the word out there for people who have not been able to attend Convention. So whenever you are ready. Denis deVlaming: Okay. My name is Denis deVlaming. I have been practicing criminal law for 46 years; I started out as a prosecutor, now I have my own criminal defense firm. I am board certified in criminal trial law and I am an adjunct professor at Stetson College of Law. So that’s kind of my background in a nutshell. I like to lecture about case law. I have been giving the Board Certification case law for 26 years and so the Florida Bar asked me to give it to the Florida Bar Convention today. Karla Eckhardt: Great. And what are some of the major points that you discussed throughout that discussion. Denis deVlaming: My discussion today was only 50 minutes long, so I didn’t have an opportunity to give a tremendous broad scope. But they asked me to talk about cases that came out of the United States Supreme Court of import and the Florida Supreme Court, not the District Courts of Appeal. So I hit on some of them today and there were about 175 people in attendance. Karla Eckhardt: Wow. What would you like people to know that maybe you didn’t get to touch upon during your lecture? Denis deVlaming: Well, let me touch a little bit about the most salient cases that came out of the Supreme Court, because I think your listeners would want to know the latest as they say. Denis deVlaming: There is a case called Pena-Rodriguez v. Colorado at the United States Supreme Court that sort of changed the game in one particular area of the law. It used to be that the courts would not look into anything that the jury discusses during their deliberations, in any respect, unless of course they got information that was extraneous, like they brought Google in or things like that, but other than that, they really were not allowed to go into that. Pena-Rodriguez changed that, because what had happened was there was tremendous jury bias and prejudice during the deliberations about Hispanics and many jurors said that they wouldn’t believe a Hispanic individual in any respect and then they ruled against him because of his heritage and a juror came out and told the judge about how bad it was during the deliberations. Well, normally it’s hands-off. I mean people can talk about what they want to talk about and even exhibit their prejudices and so forth. But the US Supreme Court said we are going to draw the line and we will allow the courts to go into matters where the jury makes their decision based upon a racial prejudice involving heritage and so forth. So it was a game changer, but it was limited to those discussions. Karla Eckhardt: I can’t believe that actually happens. You want to believe that the whole process is very fair and unbiased, but of course it’s incredibly important that when you are judged by a jury of your peers that you are not judged based on the color of your skin or your heritage, that’s just awful. So that’s fantastic that the Supreme Court definitely decided to get involved in that. What other cases, so there are a few more cases I am sure that you discussed? Denis deVlaming: I did. There was a case called Birchfield v. North Dakota. For as long as I have been practicing law, the law in Florida was that if you were under the influence of alcohol, to the extent that you were impaired and you hurt or you killed another person while driving a vehicle, the police could ask for your blood and if you didn’t give it, they could hold you down and take it, they could literally hold you down, put a syringe and take it. And the US Supreme Court said that was a violation of the Fourth Amendment. Because it was intrusive; there was a needle that was put into your body that the police now have to apply for a warrant to be able to get that blood sample. So if the motorist does not consent, then you can waive any constitutional right and consent, the police now have to apply for a warrant. Now, they did have one out and that was called exigent circumstances. So for example, if it was very rural and they couldn’t get to a magistrate because it’s an hour drive away, they would say that there were exigent circumstances and you could then take the blood. Karla Eckhardt: Wow. My husband is in law enforcement so I had an idea about that, but I didn’t realize that there were exigent circumstances. So what would be considered as an exigent circumstance? Denis deVlaming: Well, there was a recent case, and when I say recent, I just read it the other day, where there was a traffic accident and it involved multicar crashes. One of the persons involved was intoxicated. He was taken to a hospital. The police had to stay and treat the other people and conducted a vast extensive investigation about how the accident happened. And between what they had to do at the scene and their obligations to the other people who were hurt at the scene and taking the defendant to the hospital, they said to be able to leave, run and find a judge and do it was not reasonable and so they found there was exigent circumstances. It’s on a case by case basis and we will see as the appellate court cases are decided. Karla Eckhardt: Well, that’s great, there is progress. And then I think you have one more case. Denis deVlaming: Well, I have another out of the US Supreme Court, you are right, and it is Utah v. Strieff. That is a really another huge change in our laws and it affects the Fourth Amendment. And what they ruled in the Utah case was if the police — they call it the attenuation doctrine. If the police conducts a search, a Fourth Amendment search that is unlawful, but the police conduct is remote, in time, or interrupted by intervening circumstances, they will still allow it. What happened there was a guy was coming out of a crack house. The police wanted to question him, but they had no reason to believe he had bought any drugs or done anything wrong. So they stopped him. That’s called an investigatory stop to investigate. Well, you need probable cause. So if you search somebody in that case the evidence gets thrown out because you had no right to stop him. But what happened was they did stop him, they did search him, they did find drugs, but they also when they ran his name found that he had an outstanding warrant, which would have allowed an arrest. So they allowed the drugs into evidence and said the Fourth Amendment does not apply. So it carved out an exception to what normally would be the exclusionary rule. Karla Eckhardt: A slippery slope though. Denis deVlaming: It is a slippery slope. It is. I will tell you the law would have been different had there not been a warrant outstanding for him, then they — in fact, even the government conceded, there was no reason to stop him, no probable cause to stop him, but they argued because of the intervening circumstance that it was okay. So if there was no warrant, it would have been thrown out and it would have been suppressed. Karla Eckhardt: Incredible. Exciting stuff. These are things that people watch on TV and they think only happen on TV shows, but it happens everyday. Denis deVlaming: It does, it does. And parenthetically Karla, I get asked a lot about the case that they are bringing to me is going to get dismissed because they didn’t advise me of my rights, they didn’t give me any Miranda rights and they think that not giving the Miranda rights means the case is going to be dismissed; it doesn’t. It only has to do with a confession that they gave or didn’t give. Denis deVlaming: Or they didn’t write — word for word, or you missed this phrase, you didn’t say that he could have a lawyer while being questioned. So you are right, we have the same thing. Karla Eckhardt: So it’s incredibly important that everyone cover their bases. So before we close out, I have one more question. If our listeners would like to follow up with you about topics we discussed today, how can they reach you? Denis deVlaming: Probably the best way, I am an email junkie, so probably email would be the best way, and that way I can look at it when I have time to look at it and respond. My email address is my name. So it’s HYPERLINK “mailto:[email protected]” [email protected]. Karla Eckhardt: Perfect. And just a sidebar, I would be remiss not to point out, you are an email junkie, we are all about mental health and wellness, so don’t let your emails drive you crazy everyone. When people email you, take your time. 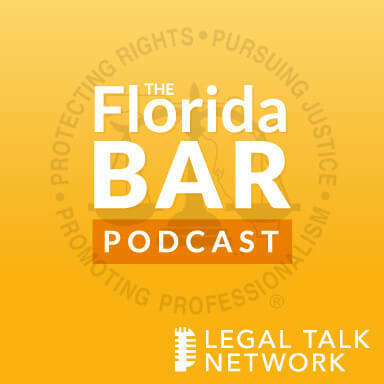 All right, well, this has been another edition of The Florida Bar Podcast brought to you by the Practice Resource Institute on Legal Talk Network. I want to thank our guest for joining us. And if you liked what you heard today, please find and rate us in iTunes. I am Karla Eckhardt. Until next time, thank you for listening.